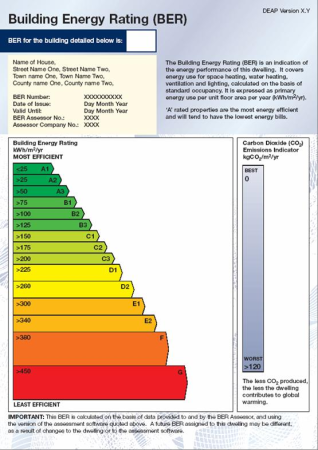 A building energy rating is a rating on the overall energy efficiency of a building (residential or commercial). The rating is similar to the energy label on your fridge and is denoted on scale of A to G, with A1 being the most energy efficient and G being the least energy efficient. The building name and address, a BER number, the date of issue, the date until when the BER is valid, the BER assessor number and the BER assessor company number. You are only required to have an energy rating carried out if you are selling or renting your house. A BER enables you to understand the overall energy efficiency of a home. Since the 1st January 2009 BER ratings are be required for any existing buildings offered for sale or rent, regardless of the age of the building. This means that if a property is re-let or sold, it must have a BER Certificate. The property owner, landlord or their agent will be able to provide you with more detail on the buildings rating. A BER for a house is calculated using the Dwelling Energy Assessment Procedure (DEAP) software published by Sustainable Energy Ireland (SEI). The DEAP software will also calculate the carbon dioxide emissions associated with the house. The BER calculation includes energy use for building fabric, space heating, water heating, ventilation and lighting and is calculated on the basis of standard occupancy. A BER is carried out by specially trained BER assessors, registered by Sustainable Energy Ireland (SEI). For more information see the SEAI website.